Frizz is caused when you hair is dry and damaged, lacking essential nutrients and proteins. There are a few things that can help maintain frizz and help you reign in control on your hair. 1. Ask your stylist for a conditioning treatment, we will be happy to help you! We will deep condition your hair using Redken Real Control treatment, comb it through the ends and let you set for a few minutes to help nourish you hair and scalp. 2. Use a smoothing shampoo and conditioner when you wash your hair, Pureology Super Smooth line is a great way to tame locks daily, with an added bonus of color and UV ray protectiveness. 3. Moroccanoil is a great styling product for all hair types, but especially for frizzy out of control hair. You can apply this oil to dry or damp hair, and work it through your ends. It works as a protective, nourishing vitamin A, that will improve the elasticity of your hair. 4. 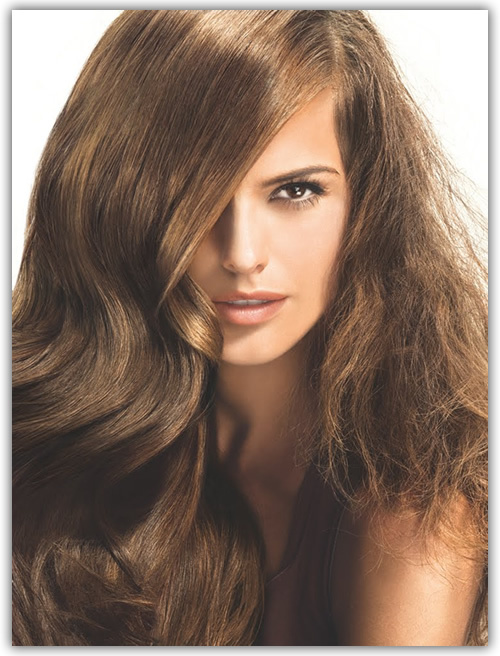 Pure NV Keratin Treatments are a great, long term way to control frizz and curl. This treatment can be done at Trisha’s Salon with your stylist, and helps reduce bulk and frizz for up to 12 weeks. It is a great service to for clients of all ages!